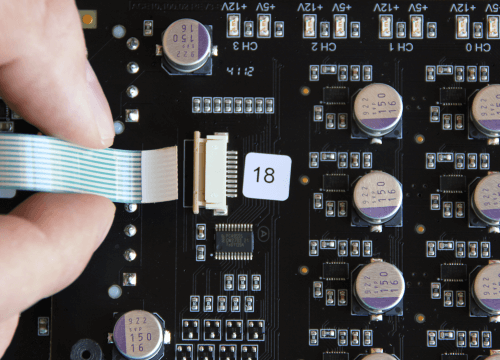 The Power Supply Unit is designed to be installed by a properly qualified engineer. The user takes all the responsibility for the installation. ATTENTION! 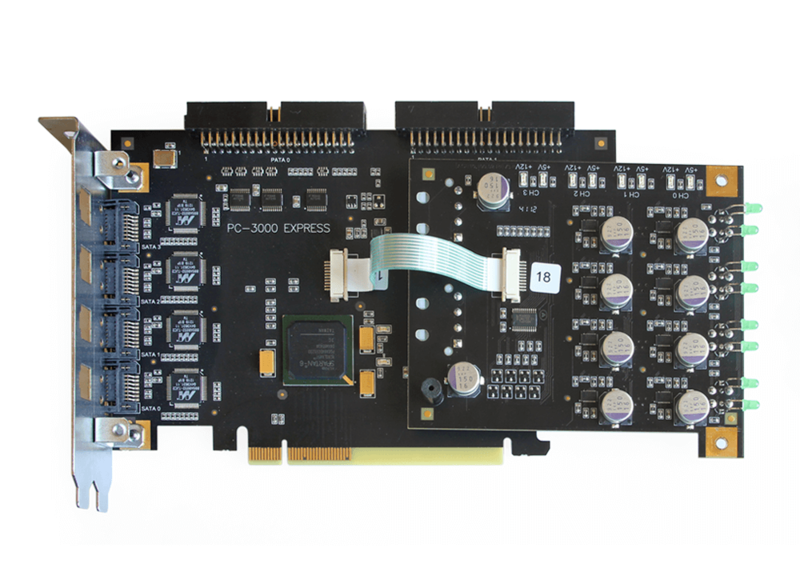 The mechanical damage of the PC-3000 Express board or of its elements such as flexible cable, ports, etc. is not covered by warranty. 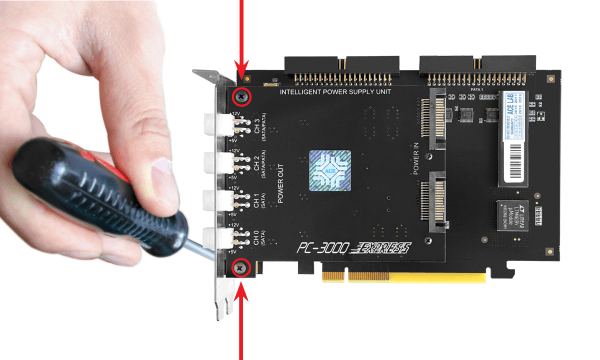 We kindly ask you to be careful during the installation of the new Power Supply Unit. ACE Lab shall not be responsible for any damage caused by the user’s incorrect actions. 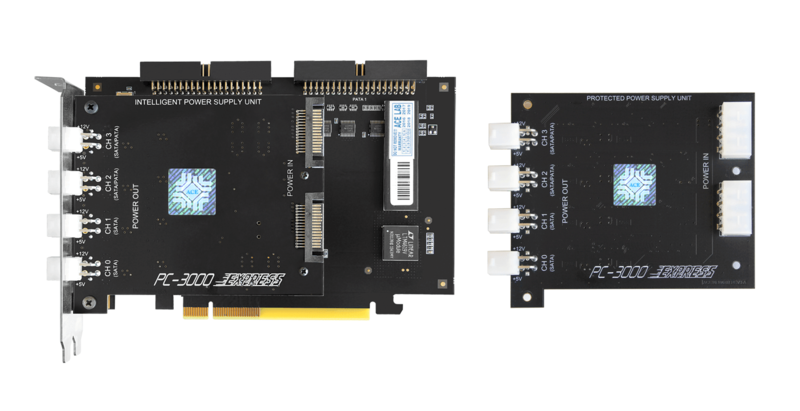 If you feel not confident to replace the Power Supply Unit on your PC-3000 Express board yourself, you can order this service from ACE Lab. 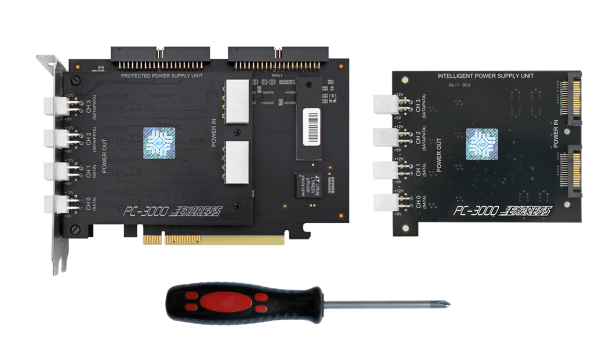 Price for the Intelligent Power Supply Unit, installation, full diagnostics and testing your PC-3000 Express is €650 plus shipping cost in both directions. 2. Unscrew 2 bolts on the front side of the Protected Power Supply Unit. 3. 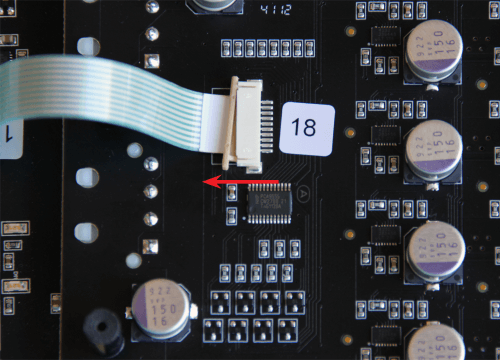 Unscrew 2 self-tapping screws on the back side of the PC-3000 Express board. 4. 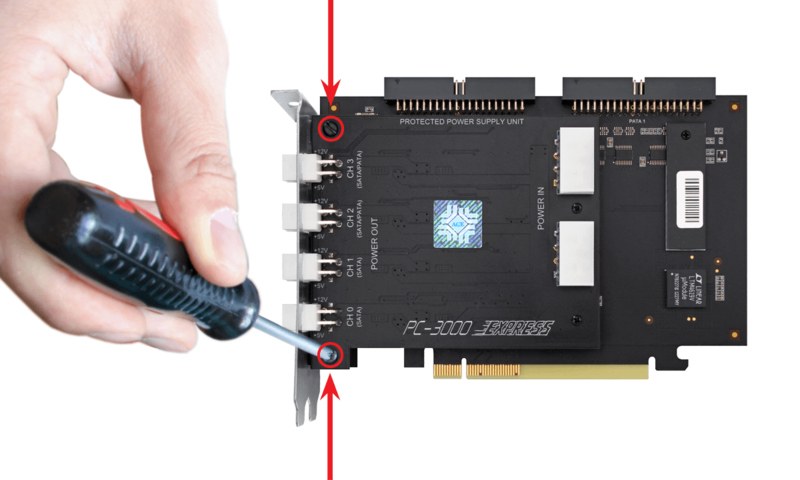 Disconnect the Power Supply Unit from the metal fixation bracket. ATTENTION! Do not remove the Power Supply Unit for a long distance from the PC-3000 Express board. 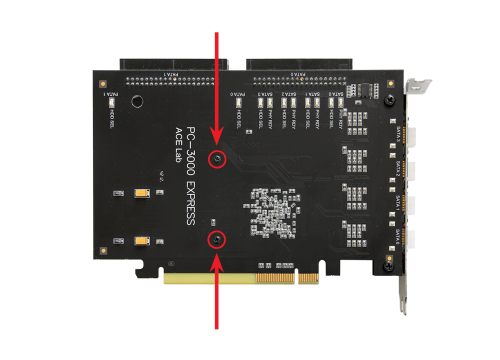 Be careful not to damage the flexible cable that connects the Power Supply Unit to the PC-3000 Express board. 5. Turn the Power Supply Unit over to the opposite side. ATTENTION! 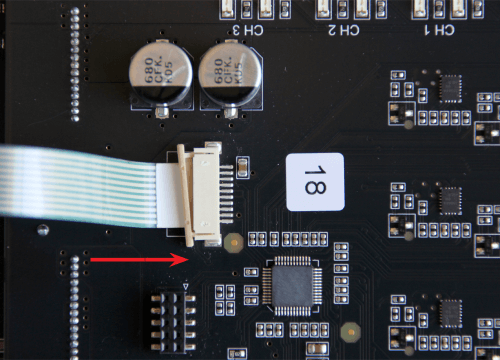 Do not over-tighten the flexible cable! 6. On the Power Supply Unit, push aside one side of the connector’s fixing lock where the flexible cable is plugged. ATTENTION! Move the fixing lock gently, alternately each side. Do not use metal tools to avoid damaging the board. 7. Push aside the other side of the connector’s fixing lock where the flexible cable is plugged. 8. 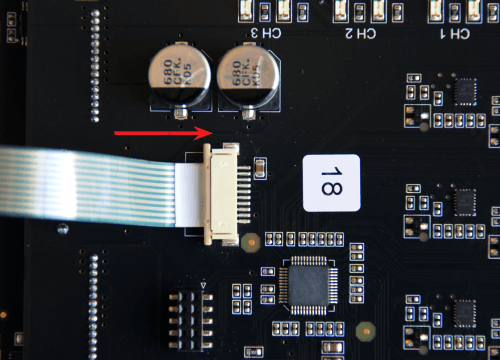 Disconnect the flexible cable. 9. Unscrew 2 plastic standoffs from the old Protected Power Supply Unit. ATTENTION! Please hold the standoffs carefully when you unscrew the self-tapping screws. 10. Attach the two standoffs to the new Intelligent Power Supply Unit. ATTENTION! Please hold the standoffs carefully when you screw the self-tapping screws. 11. Set the Intelligent Power Supply Unit for the flexible cable installation. 12. Firmly connect the flexible cable to the connector of the new Power Supply Unit. ATTENTION! 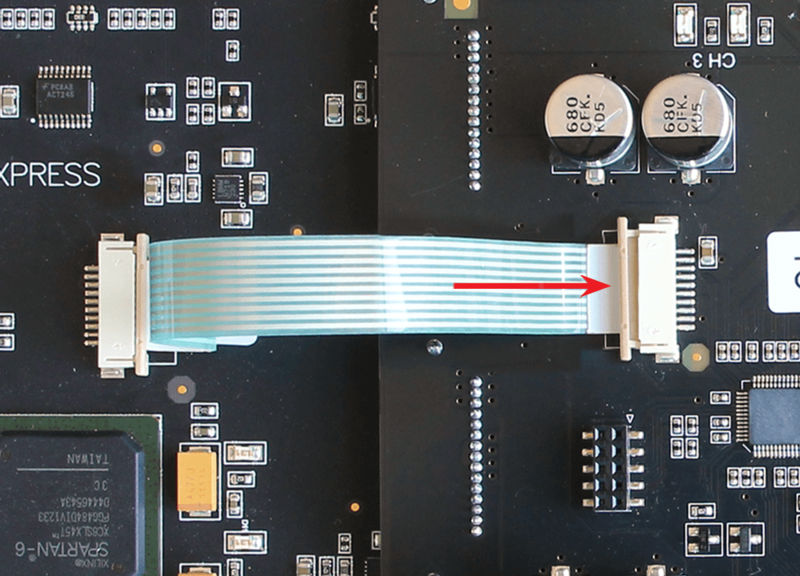 The flexible cable should be connected to the Power Supply Unit board with the contacts down. 13. Snap one side of the fixing lock. ATTENTION! Snap gently, alternately each side. 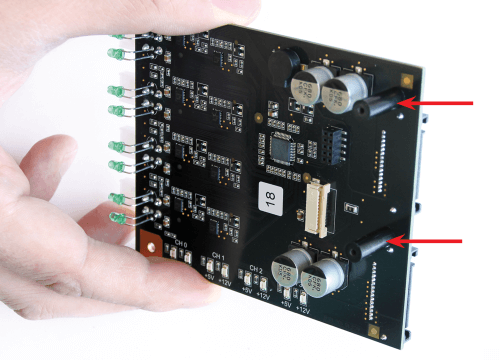 Do not use metal tools to avoid damaging the board. When snapping, hold the flexible cable carefully. 14. Snap the second side of the fixing lock. 15. 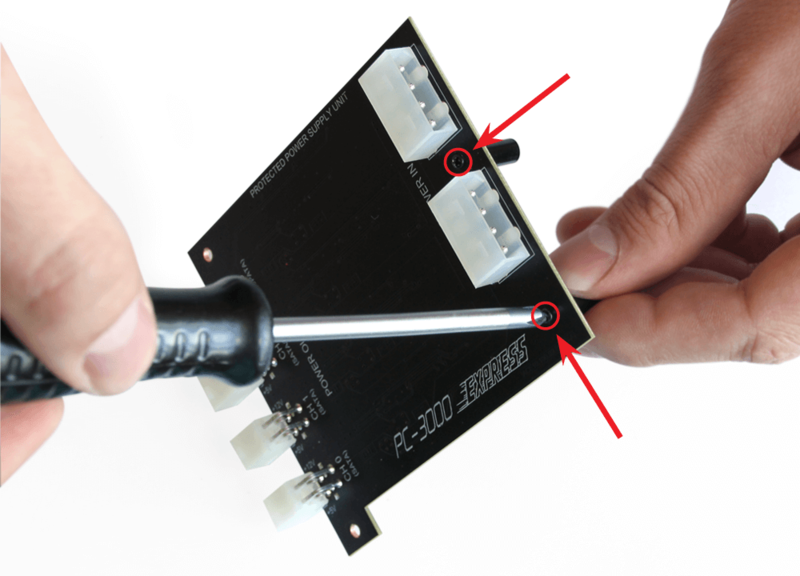 Turn the Intelligent Power Supply Unit over to the opposite side and install it into the metal fixation bracket. ATTENTION! 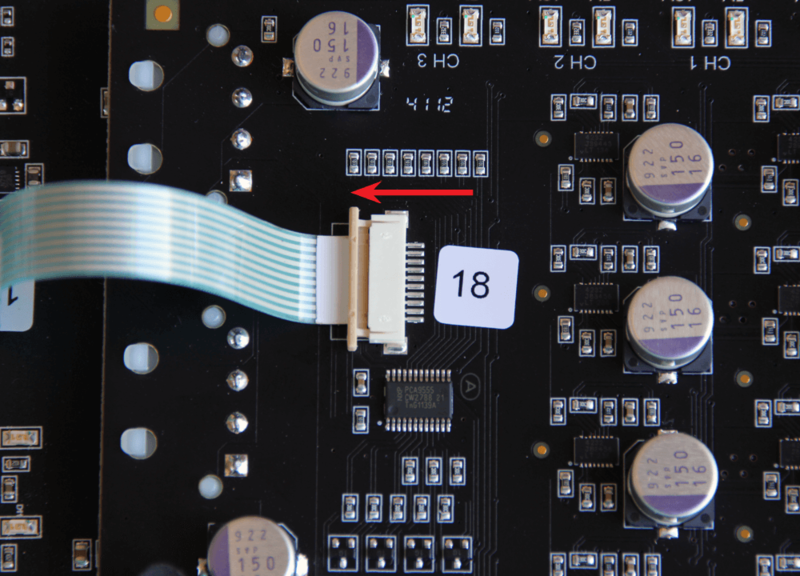 Check the location of the LED indicators on the new Power Supply Unit before installing. Make sure that they match the right holes on the metal fixation bracket. 16. 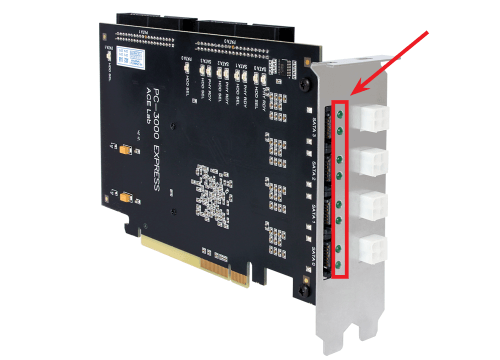 Check if all the LEDs have matched the holes of the metal fixation bracket. 17. Screw 2 bolts on the front side of the Intelligent Power Supply Unit. 18. Screw 2 self-tapping screws on the back side of the PC-3000 Express board. 19. Congratulations! 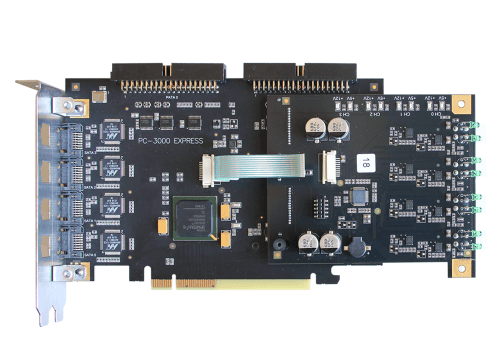 PC-3000 Express with the Intelligent Power Supply Unit is ready for use.